Saul “Canelo” Alvarez vs Erislandy Lara: Who Will Win And Why? Oscar De La Hoya and his Golden Boy Promotions will be presenting Canelo Alvarez vs Erislandy Lara tonight on Showtime boxing pay per view. The boxing event will be live from the sold out MGM Grand in Las Vegas. The fight is a non title bout. Both men are elite boxers who will either put on a somewhat boring and safe fight or they could go out guns blazing and give the fans a show. But the question remains: who will win and why? Erislandy “The American Dream” Lara (19-1-2, 12 KO’s) is a Cuban boxer who has won gold at the World Amateur Championships in 2005 and 2006 at the welterweight limit. Lara also won a silver medal in Moscow in 2005 at the World Cup. In his professional boxing career, Erislandy Lara has faced and defeated Austin Trout (easily), knocked out Ronald Hearns (in the first round), Alfredo Angulo (via knock out), and Freddy Hernandez (via 10 round decision). The only loss on Lara’s resume is against Paul Williams in 2011 and anyone who watched that fight knows that Lara won that fight. The Paul Williams decision win over Erislandy Lara was and still is one of the biggest robberies in boxing. Since that loss, the (southpaw) Cuban has gone on to win five fights in a row. Erislandy has been calling out Canelo Alvarez for a very long time and he finally got the fight against the Mexican superstar. Lara barged into the post fight press conference after Canelo defeated Alfredo Angulo and demanded an answer to his challenge. Not since Antonio Tarver called out Roy Jones Jr at a press conference has such a fight been made immediately for the pay per view audience. And those who know boxing, know how Tarver went on to dethrone Jones, Jr (although it happened in their second fight). Lara and Canelo share two common opponents: Alfredo Angulo and Austin Trout. Although Angulo dropped Lara twice in their fight, Lara came back to defeat Angulo. As for Austin Trout, Erislandy Lara defeated him easily, while Canelo struggled. Canelo, however, did defeat Angulo pretty easily and was never really hurt in their showtime boxing spectacle. Those who sit at ringside boxing shows and know the background of both men know that this is a very tough fight to call. Even those into sports betting know that this could end up being a “too close to call” fight but surprisingly, the odds have been shifting more in Canelo’s favor. Vegas sports betting experts currently have Canelo as a -175 favorite (and that is inching up to -200 on some sites). Personally, I don’t understand how that can be since Lara is, by far, the superior boxer. Oscar De La Hoya, the top guy at Golden Boy Promotions, has a lot riding on Canelo Alvarez. First off, Canelo is the top money maker for Golden Boy. Alvarez also has the handsome look and marketability that can appeal to women and casual fans alike. The ginger-haired boxer from Mexico is also a soft-spoken, nice guy who respects his opponents and isn’t classless like Adrienne Broner, Floyd Mayweather, or Derek Chisora. Canelo is a man who can be considered a true ambassador of the sport of boxing. Although Canelo Alvarez (43-1-1, 31 KO’s) has lost only once, his loss was to boxing’s pound for pound star, Floyd Mayweather, Jr. There is absolutely no shame in losing to Mayweather. As in all combat sports, styles make fights, and so Lara vs Canelo is a nightmare match up for Alvarez. Showtime boxing has certainly done a great job of putting this fight on pay per view. With Canelo seeking to prove that his lone loss was and will be an anomaly, Lara is seeking to show the world that he is the true king of the light-middlweight division. Boxing belts won’t matter in this fight as this is a non title fight. 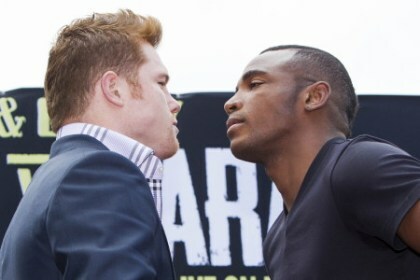 Erislandy Lara will most likely win a decision against Canelo Alvarez. The Cuban’s precise boxing style will prove too much for the handsome Mexican, who will probably go into desperation mode as the fight progresses. Combat sports have shown that desperation later in a fight leads to mistakes and so Lara might be able to drop Canelo if and when that happens. Alvarez, however, is too good to get knocked out so he will put everything into every punch. The only way I see Canelo defeating Lara is if Lara chooses to trade with Canelo. Erislandy is too smart to do that so don’t look for an all out war in this one. If for some reason the fight is close, look for the judges at ringside to score the fight in Canelo’s favor. Alvarez is clearly the more marketable fighter and he is Oscar De La Hoya’s and Golden Boy’s top star. Hopefully, there won’t be any sort of robbery tonight. The people in attendance and those watching on the big screen deserve better. Hopefully, both boxers will give the fans around the world a show to remember. Besides, isn’t that what combat sports are all about?